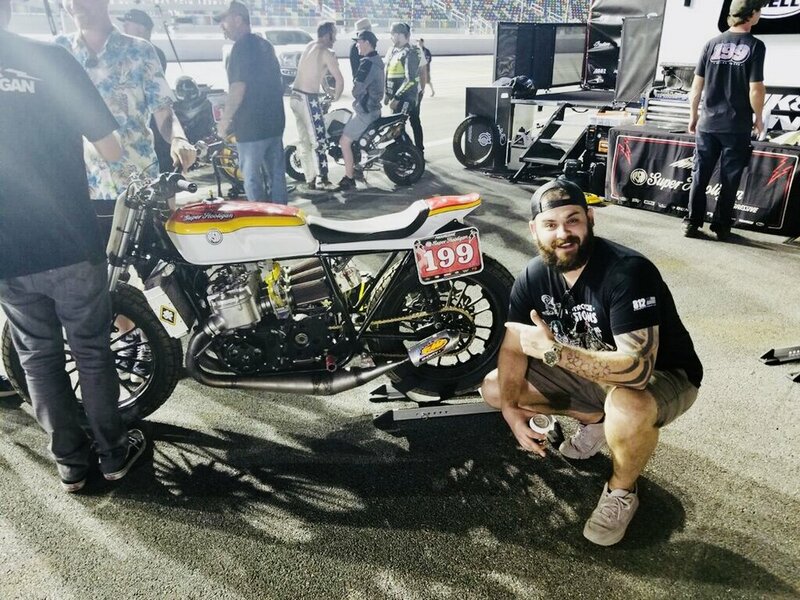 As part of our Indian Motorcycle Bike Build Off, Indian sponsored the guys on a little getaway to Daytona for Bike Week. The week was filled with amazing experiences including unfurling the flag at the opening ceremonies of the Flat Track races, meeting Roland Sands, 20th Century Racing, Travis Pastrana, Gloria Struck, Moonshiner Josh, Bill Dodge, Michael Lichter, Chris and Heather Callen (Cycle Source Magazine), Xavier Muriel, Kory Souza, Buzz Kanter (American Iron Magazine), Marilyn Stemp, and more. We visited Standard Motorcycle Co and Ace Cafe in Orlando, also. Finally, they got to get some time in on their bikes and visit with some of the M2 build sponsors. To cap it all off, Kory Souzas No Class Bike Show.